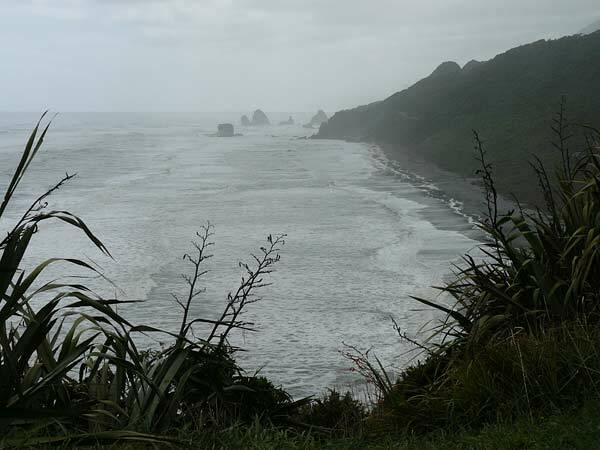 On Monday, February 25, we left Hokitita, bound for Rapahoa, just 47 kilometres away, north of Greymouth. Greymouth is the largest town on the west coast, and it gets a bad rap from tour guidebooks and from some Kiwis as well. In fact, warehouses, trucking depots, lumber yards, cement plants and other such businesses have to be located somewhere, and in this part of New Zealand, they are in Greymouth. We stopped only to shop and to have Wally's eyeglass frames fixed, but the people we met so briefly were delightful, and we didn't feel that Greymouth was a bad place at all. The weather was changeable when we left town for the few remaining kilometres to Rapahoa. We were headed there because we'd been told the holiday park there was nice. In fact, we didn't much care for it, but it was on a beach that was simply spectacular, especially beneath the ever-changing sky, and the walkways were all lined with incredible, brightly coloured, rounded rocks that had been garnered from the beach below. On the 26th, we planned another short ride because we wanted to stop for a day at Punakaiki, known in New Zealand for its "Pancake Rocks" and also for beautiful walking trails. 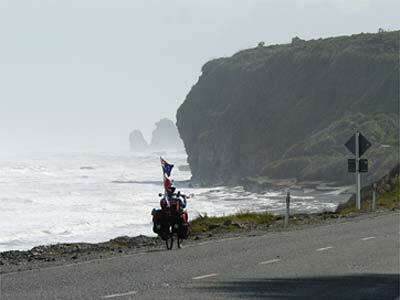 The 38-kilometre ride to Punakaiki was one of the best of the trip so far. The weather was changeable again, fair when we started (right), then rapidly darkening (below). At a viewpoint, when it was getting chilly and rain was threatening, we stopped to take the photo above. A friendly Kiwi family who had parked at the same overlook (right) invited us into their camper for tea and coffee. When we resumed our ride, the sun came out and the skies turned blue. There was a series of short but steep hills along the coast. Climbing the hills was more than worth the effort because they offered one grand ocean view after another. Punakaiki did not disappoint. A nicely designed, paved walkway winds through the rocks, and there are marvelous views like that below. Some people see faces of a man and a woman in these formations. When we arrived, the tide was high and the waves were rough, which is ideal. There are views down into chasms like that to the left. Turbulent seas burst through blowholes, below, sometimes soaking delighted tourists. In the evening, sunset on the beach near our campground was spectacular. The next day, we spent a couple of hours on a walk along the Pororari River. We saw kayakers, and we heard lots of birds, but saw only a bold robin. At Punakaiki, the cyclists we've been meeting were together again at the campsite  Dave and Jo from England, Martin and Francziska from Switzerland  plus a delightful couple from Holland, Maurice and Corine (right), who were riding the coolest (and most expensive) recumbents we've seen yet. Wally had a chance to ride Corine's for a few yards in the campground, and it was quite a bike. Maurice seemed a little skeptical that we would actually like our Rans recumbents! Then again, their Rohloff hubs cost almost as much as our complete bicycles! On Thursday, February 28 after two nights with very little sleep (the first due to bright lights and the second due to incredibly rowdy partyers who made noise until 5:30 AM), we cycled from Punakaiki to Westport. This 60-kilometer ride was, if possible, even more beautiful than the ride from Rapahoa to Punakaiki. There were some more difficult hills, one called Perpendicular Point (an intimidating name) and another called Pakihi Hill, that was actually harder. Of course, without the hills we wouldn't have had the wonderful views. There were also beautiful beaches, said to be too dangerous for swimming, but delightful for wading and splashing around. For part of the day we rode with Maurice and Corine. Their recumbents were clearly faster than ours  or could it have been that the riders were 30 to 40 years younger than us? In any event, we all made it to Westport at about the same time. Cycling so beautiful that it's ridiculous! We arrived in Westport on Thursday afternoon. It's the norhternmost major town on the west coast. Like Greymouth, Westport also gets fairly low marks from some of the guidebooks, but we quite liked it. A sign on the outskirts of town says it all. Dave and Jo along with their friend Mark, Maurice and Corine were also at the campground in Westport; Martin and Francziska had gone east over the mountains from Greymouth. The big surprise was that we checked email and learned that Ken and Annie Matzner from Montpelier were in town just a few blocks away! We left a message at their hostel, and they came by the campsite in the evening. Better, they returned with their rental car in the morning, and we all went for a drive. With Ken and Annie we visited Cape Foulwind and the nearby seal colony. 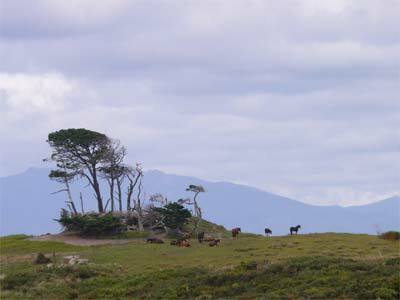 We also drove toward Karamea, at the top of the dead-end coastal road. We didn't go the whole way, just far enough to convince Barbara and me that it would have been more work by bicycle than it was worth. On the road to Karamea, however, there were a couple of neat places that we'd probably not have visited by bike. One was a walk along a small river near the hamlet of Seddonville (right). The other was Gentle Annie Beach (below). It was great fun to spend time with Ken and Annie, whom we know from the Montpelier Cohousing group. And we covered so much ground in a day, traveling by car! But in some ways, it made us realize that we prefer touring by bike. Ken and Annie dropped us back at the Wesport Holiday Park for our second night there. The next morning, when we had planned to leave, there was a steadily increasing downpour, though as yet with no winds. A lake was threatening to inundate our tent so we moved inside. As we write this on Saturday, March 1, it's beginning to seem that we may be here for another day. When we leave  whenever that turns out to be  we'll be heading northeast, away from the west coast and toward to northern end of South Island.